The story follows Keller Dover, a desperate father attempting to recover her missing daughter and her friend. While Detective Loki have been assigned to the case and has the whole police department looking for them, Keller Dover feels hard done and takes matters into his own hands and captures and tortures a suspect, and begins to question his morality and lose his soul in the process. 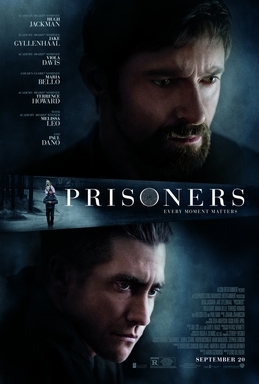 As a drama-thriller kind of movie, Prisoners did amazingly brilliant. The story was great and full of emotional scenes, while the tension grows as the movie progresses, and some scenes were just very suspenseful. But the movie did seem slow paced, although it seemed deliberate. The best thing about this movie is that it makes us question about the sense of morality, about who's good or bad and what's right or wrong. In the end, we may feel that we have been rooting for the wrong guy after all, while also having the sense that every man and woman has their light and dark side after all. It's the kind of movie that is full of questions and ambiguity that we walk out most likely thinking back to what really happened back there. The movie felt slow paced, yet it may be deliberately so and I can see the reason behind it, such that they build up the tension and confusion in the audience. And the running time was without question very long, and though it may be good to serve the purpose, there are some drawbacks too. The movie went on very long, such that I gradually lost the sympathetic feeling of the family having a missing daughter, which wasn't supposed to happen. Audiences are supposed to be kept rooting all the way. It could just be me, however. The acting was brilliant by most of the cast, and I have to say that Mr. Hugh Jackman, who displayed more rage than Wolverine ever did, really deserve another Oscar nomination. No proper action sequences and no comedy, since its a complete drama-thriller film. As an action lover, I didn't thoroughly enjoy the movie, but I appreciated what they brought, and I have to admit, drama-thriller lovers would really love this movie.